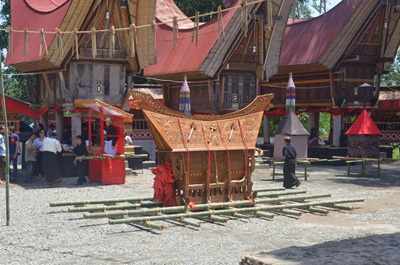 Many vacation destinations are available in Tana Toraja, South Sulawesi. As for a reference, you must visit Rateallo. It is an exotic region with its unique tradition. Also, there is the best attraction called mottled buffalos. Due to their rare sculptures, their price is definitely expensive. A single mottled buffalo costs about IDR 1 billion. No wonder, many tourists come to Ranteallo to witness such animal. It also becomes your opportunity to take pictures with the buffalo. What you need to do is to talk to the owner. As mentioned before, the best lure in Rateallo is the mottled buffalos. According to the locals, there are several castes of buffalos in Tana Toraja. These include Tedong Sambao, Pudu, and bonga. The highest caste is Tedong Bonga. The characteristic is definitely the striped color. In fact, there are different types of Bonga. It depends on the location of the stripe. When it comes to the most expensive one, it is called the caste of Tedong Saleko. Those who can afford it are considered a noble. The villagers allow visitors to take pictures with buffalos. As long as you get the permission, you are able to do so. Apart from such animal, you can also witness other attractions there. For instance, there is a complex of traditional houses. The locals call it Tongkonan. Their shape is both unique and beautiful. No wonder, most visitors make such houses as an object of photography. Make sure to get along well with the villagers, too. It is because they may help you to get in Tongkonan. Where can visitors find the buffalos? Usually, the owners put them in the back of their house. There is a cage in each of the houses. It stores different types of animals such as buffalos and pigs. The owner gives special treatments to these animals because they are going to sell them later, especially for a part of a traditional ceremony. In terms of size, they weigh differently. Not to mention their appearance is distinct. Due to their value, the prices are definitely amazing. Both pigs and buffalos are important animals in Ranteallo City and other regions of South Sulawesi Province. During Rambu Solo traditional ceremony, you may see lots of them in the field. It is because the villagers are going to sacrifice them. For tourists, a traditional ceremony in Ranteallo and those valuable animals are indeed interesting. Thus, lots of tourists keep coming to this location either to enjoy traditional ceremonies or taking pictures with buffalos. In order to reach Rateallo, you should head to Tana Toraja Regency. It will be easy if you come from Makassar City. What you need to do is to take Poros Barru – Makassar Street. The trip takes about 7 hours and 30 minutes and the distance is roughly 315 km. It will be a longer trip if you come from Jakarta. That means you need to take an airplane, as well.